Virginia Satir, a noted psychologist, stated that four hugs a day are needed for survival, eight per day for staying calm, and twelve per day for growing stronger. I believe it, and I don't think the statement is narrowly applied. And while I found it certainly a darling photograph and storyline, I couldn't speak to its validity being neither a parent nor a doctor at the time. 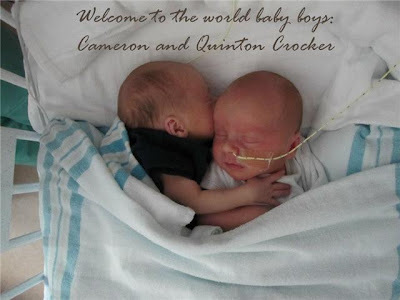 However, a dear friend of mine from college who is a parent and a doctor, delivered twin boys fairly early. While they were in NICU, she sent me this photo, to which I added a little welcome to them. And one is clearly embracing the other. Her husband warned that a more precious photo might never have been taken. I concur. And the boys are healthy and happily now at home with their family. So hugs heal, stabilize, and satisfy an incredible fundamental human need of affection and touch. And just like Ari Gold, I like to hug it out too. So I find it quite interesting that primary and secondary schools from Oregon to Connecticut are banning hugs or mandating a three-second rule. Wow. Hug as greeting is ok but prolonged hug, not ok. Got it. Now, I may alter my tune when my own child is in the 7th grade hormone-addled game of Twister, or, when we catch him as a teen with one of his girlfriends in what surely looks like a naked frolic but he assures us they were just "hugging". But for now I am glad children are showing some affection and instilling some actual human contact during their 100+hours a week of texting and mySpacing. And the hugs, well, they seem quite mild compared to what you know they might be dishing out under the bleachers. I am sure the schools, acting in good faith to protect the children they serve, attempt to make the best decisions possible but in a world of outlandish behavior, bullying, weapons in school, and physical attacks on teachers, the hug, well, it seems uplifiting. 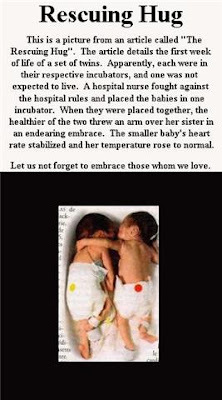 And the hug worked on these babies, and I certainly know they work on me. So here's to getting your four (at least) a day. And the thing that is so frustrating is that kids are natural born huggers, and to force them to refrain might make them believe that something is wrong with touch in general. So sad! That picture of the twins is just beautiful. Thanks for sharing! I think hugs should be like multivitamins. Take at least 4 a day. Your article is a good reminder that good things in life are free. How about giving at least 4 a day as well?